The "Peregrine" or Step Down is a high performance short board designed 1" to 2" shorter than a pure short board. 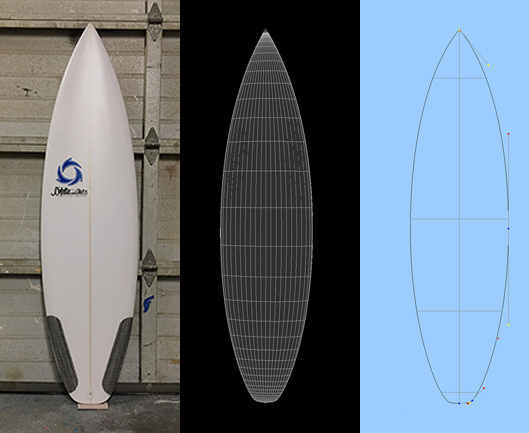 This design offers short board performance in smaller or marginal waves. These shapes evolved from surfers looking for a shorter - tighter turning radius to maximize performance in these conditions. Of note is the ability of this shorter design to perform in good and excellent waves as well. The design has become ta "go to" board for performance surfing. The shorter rail line keeps the board in the pocket - this is an excellent design for vertical maneuvers. Key design features are the shortened rail line, added surface area with the slightly wider outline than the Redtail Pocket Rocket. Bottom contours are single concave entry and wide point to deep single concave through the fins or optional single concave entry and wide point to deep single to double concave through the fins. The single has a little more lift and speed and the single to double has a little more control. Rocker, outline, bottom contours, profiles and rails are fully integrated to maximize performance.